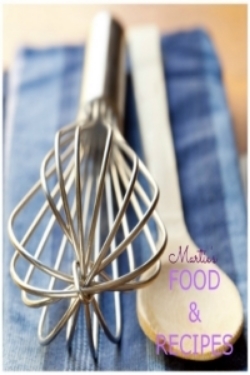 The official blog for Food Network Star Martie Duncan. 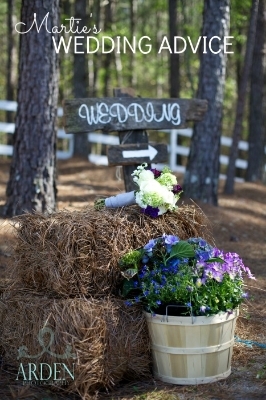 Find Martie's recipes, helpful tips, party themes, the latest wedding trends, party decorating ideas, and what she's been up to lately including travel suggestions like where to eat and where to stay. For the grits: In a medium saucepan, bring the water and milk for the grits to a gentle boil. Whisk in the grits. Add the salt and pepper. Bring to a boil. Reduce to simmer and whisk the grits often to prevent sticking. 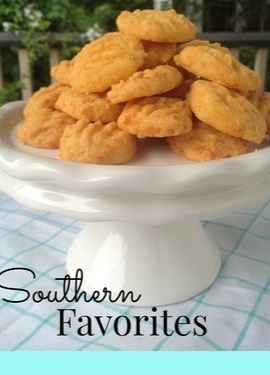 Cook for 20-30 minutes or until the grits are soft and to a consistency you like. When the grits have thickened, stir in the cheese and butter and put a lid on the pot. For the Shrimp: Add all the shrimp peel to a pot and cover with cool water. Bring to a boil over high heat. Reduce the heat to medium. Cook until the liquid is reduced by half. Allow to cool. Strain the shells and reserve the stock. Towards the end of the cooking time for the grits, in a large skillet, heat the olive oil over medium high heat. Add the onions and cook until soft and translucent, 2 to 3 minutes, stirring frequently. Add the garlic and cook about a minute. Stir in the tomatoes with half their juice; add the bay leaves and cayenne and bring to a boil. Reduce the heat and simmer until the mixture is reduced and slightly thickened, about 10 minutes. Return the heat under the tomatoes to medium high and add1/2 cup of the reserved shrimp stock and a bit more of the tomato juice, if desired. Once it is bubbling, add the shrimp and cook until the shrimp are pink and firm, approximately 5-6 minutes. Remove the shrimp to a plate. Stir in the lemon juice into sauce. Taste and adjust for seasoning with salt and pepper. Add the final tablespoon butter and stir. Remove from heat and add the parsley. Return the shrimp to the sauce. To serve, place a heaping spoonful of grits on each plate. Top with the shrimp and sauce. Garnish with additional Parmigiano-Reggiano and chopped parsley. Serve immediately. RECIPE: STRAWBERRY SCONES FOR THE ROYAL WEDDING! Ohhh, I love strawberries... and these scrumptious little scones are perfect for strawberries in so many ways.... Serve them piping hot and fresh from the oven with butter, cream, and jam or sliced for strawberry shortcake. Either way, these scones are simple to make and you can substitute the strawberries for all kinds of savory and sweet options. Read the directions carefully because the fresh strawberries make the dough a little tricky. Not hard, just easy to mess up if you are not careful when mixing in the strawberries. The batter can get too wet if you mix for more than a couple of seconds. 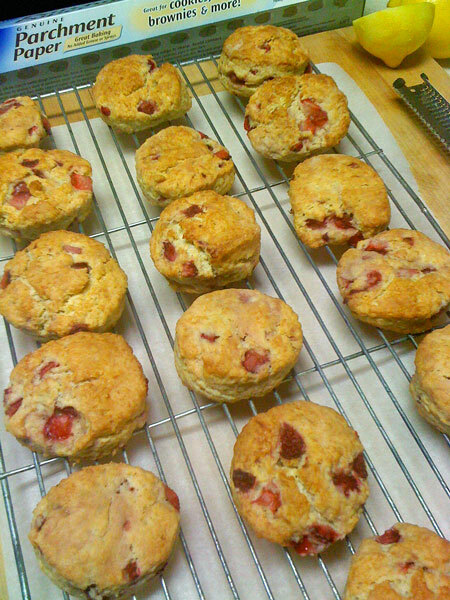 That said, the fresh strawberries make these scones so perfect for spring and summer entertaining. Enjoy! Spread the fresh strawberries out on a paper towel after you dice them and allow them to dry out a bit. This way, some of the juice is absorbed before you put them into the batter. If the berries are too juicy, the batter becomes too wet. Allow the berries to “dry” for at least an hour first before adding to the batter. Preheat the oven to 400 degrees and line a baking pan with parchment paper. In the large bowl of your mixer, combine 2 cups flour, sugar, and baking powder, salt, and lemon zest on the lowest speed of your mixer; add the cold butter until the butter is the size of peas. Crack the eggs into a bowl, one at a time; add the cold cream, vanilla, lemon juice, and strawberry extract. Lightly whisk the eggs with a fork to combine and slowly pour into the flour mixture. The batter will quickly combine. As soon as it comes together, stop the mixer. Don’t over beat. Now, quickly toss the strawberries with the remaining flour and add to the mixture. Turn on the mixer for approximately 10 seconds to incorporate the berries. Be very careful; if you mix it too much, the strawberries will make the batter too wet. If you have strawberries left in the bottom of the mixer, just dump them out with the batter and work them in when you roll out the dough. Dump the dough out onto a well floured surface. Before you touch it, I find it helps to rinse your hands with cold water so the heat from your hands does not melt the butter. Flour your hands, the rolling pin, and the biscuit cutter. Working quickly, roll the dough out to about ¾ inch thick. Using a biscuit cutter, cut the dough into circles. Place the dough onto the baking pan lined with parchment paper and brush with the egg wash. Sprinkle with sugar if desired. Bake at 400 degrees for 18 minutes or until the tops are browned. If the scones are large, you may need to increase the baking time. These scones are best eaten hot from the oven. And you can add a classic Confectioners’ sugar glaze if you like but they are wonderful without. MAKE HOT CHOCOLATE LIKE THEY DO IN SPAIN! In the cafes of Barcelona, the hot chocolate is legendary. It’s served thick, dark, and rich, flavored with espresso and a hint of orange. The chocolate there is so thick, you almost need a spoon. This is my version of the hot chocolate I came to love while traveling in Spain. The taste is the same, but it is not quite as thick. For an extra kick, add a liqueur. This one is delicious with a shot of vanilla vodka and a little Grand Marnier, but would be very good with peppermint liqueur, Godiva white chocolate or a shot of lovely, dark rum. YUM! 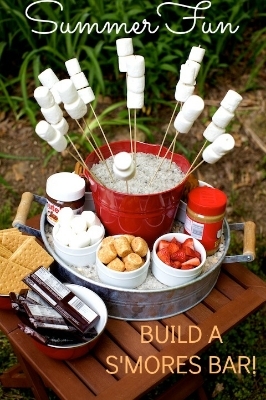 Why not set up a HOT CHOCOLATE BAR for your next party. Mix up a huge pot of hot chocolate. Display whipped cream, toppings, liqueurs, shavings, coffee flavorings, etc so guests can mix up their own concoction. Combine heavy cream, chopped chocolate, cocoa, and sugar in a medium saucepan. Stir well to incorporate, then place over low heat, whisking constantly until chocolate melts and the mixture is smooth. Gradually add the salt, vanilla, orange rind, milk and coffee. Cook over medium-low heat, continuing to stir with a whisk. Heat 5 minutes or until tiny bubbles form around edge of pan, stirring frequently (do not boil). Discard the rind. Adult version: Add one shot vanilla vodka and 1 teaspoon orange liqueur to each mug. Pour 1 cup mixture into each of 4 mugs. Spoon 1 heaping tablespoon whipped cream over each serving. Dust with cocoa powder or chocolate shavings, if desired. 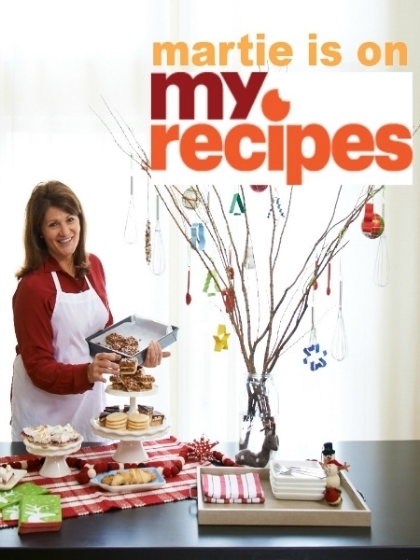 EASY TO FOLLOW RECIPES PLUS AFFORDABLE IDEAS FOR PARTIES, WEDDINGS, HOLIDAYS, AND CASUAL ENTERTAINING BY FOOD NETWORK STAR AND PARTY-THROWER MARTIE DUNCAN. 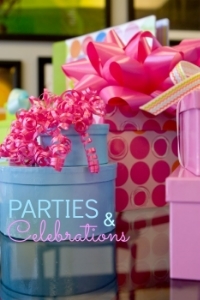 2014-2019 MARTIE KNOWS PARTIES® OFFICIAL WEBSITE FOR LIFESTYLE EXPERT MARTIE DUNCAN ALL RIGHTS RESERVED. PHOTOS AND RECIPES MAY BE USED WITH PERMISSION ONLY. Food Network Star's fan favorite Martie Duncan shares favorite easy recipes and affordable ideas for entertaining, casual get-togethers, and inspiration for parties, weddings, holidays, and celebrations.